I have reviewed every version of Peppermint Linux since version 2 and it is a distribution that I have only had positive things to say about. (Read the reviews here: Peppermint 4, Peppermint 3 and Peppermint 2). I wasn’t actually planning to do a review of Peppermint 5 yet. This article was going to be about the 2000+ games that have just been added to the Internet Archive site as they are all playable via a web browser. The ICE application within Peppermint which lets you turn any web application into a desktop application. Unfortunately it didn’t all go to plan and for this reason I have instead decided to write a review about Peppermint Linux 5, highlighting the issues that I found. Click here to download Peppermint Linux 5. You will find links halfway down the page to download 32-bit and 64-bit versions. You can also purchase a USB stick on the same site. This guide shows how to install Peppermint Linux. 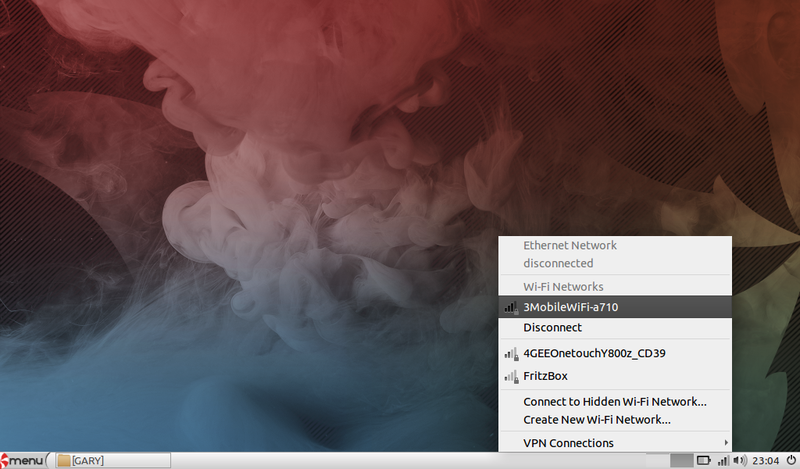 Peppermint 5 is a bit of an eclectic mix of Ubuntu, LXDE, XFCE and Mint. The main Peppermint distribution is based on Ubuntu 14.04 which is the long term support release. The desktop is LXDE but the window manager is XFWM4 which is part of the XFCE desktop. The graphical package manager MintInstall is part of the Linux Mint distribution. Visually what you see when you first log in is a dark desktop background with a single panel at the bottom. The panel has a menu icon in the bottom left and a series of icons in the bottom right including workspaces, power settings, network settings, audio settings, the clock and a power button. The menu is a fairly basic affair with a list of categories and items within the category. This sort of menu system is fine until you have lots of items within a particular category. The menus become harder to scroll through at this point. To connect to the internet click on the network icon in the bottom right corner. A list of available networks will appear. Choose the network you wish to connect to and enter the security key (if required). The default browser within Peppermint is Chromium and Flash just works without any further intervention. 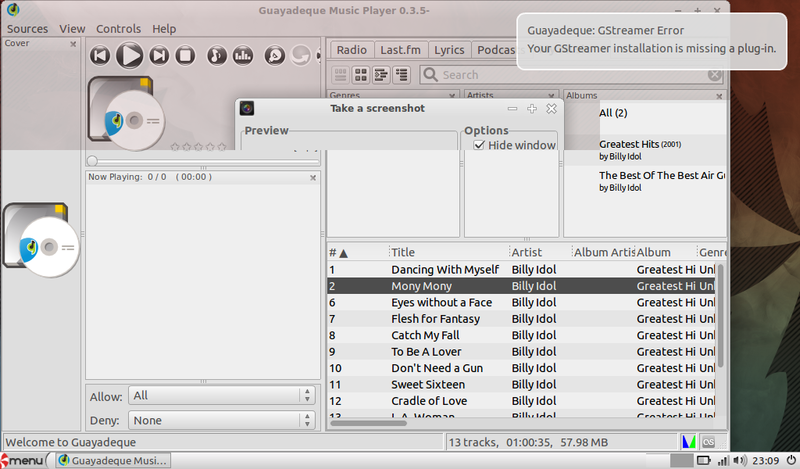 The default audio player is Guayadeque. Although it is a fairly basic audio application, it works and is easy enough to use. 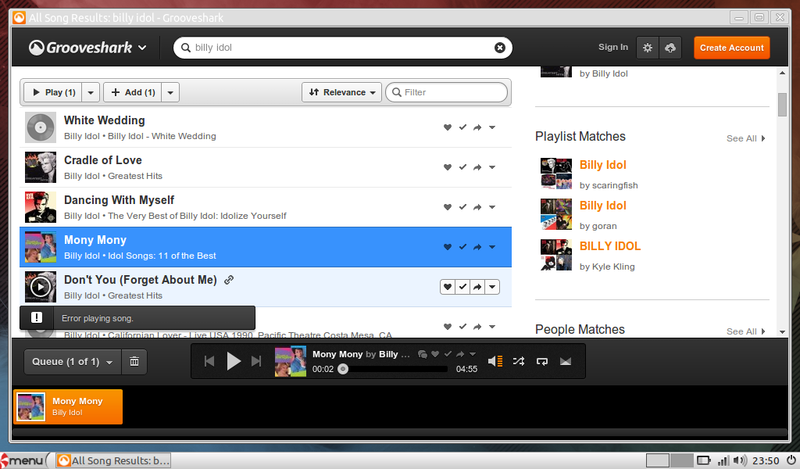 Unfortunately when I imported my Billy Idol Greatest Hits CD it wouldn’t play. This is a slight regression. In Peppermint 4 this error didn’t appear but it was present in Peppermint 3. 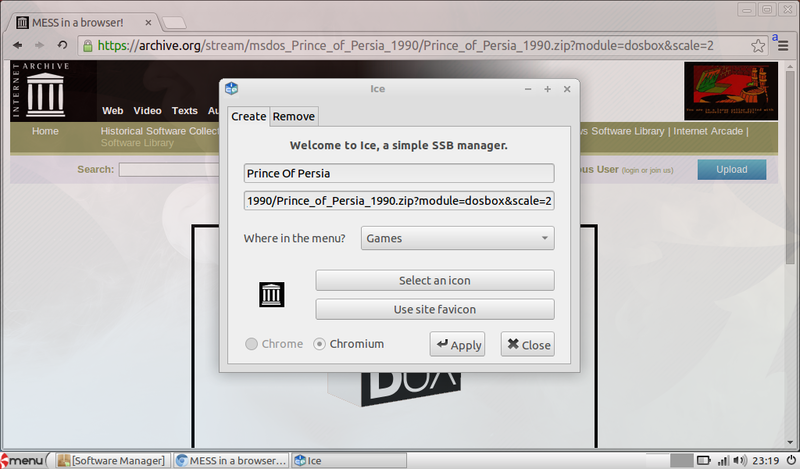 The unique selling point of Peppermint over Lubuntu and other similar Linux distributions is the way that it integrates web applications as desktop applications. There are therefore only a handful of applications that are installed by default and many of the items link to web applications which require an internet connection. The graphical application manager used to install applications within Peppermint is the Mint Installer. You can browse for applications by selecting a category and searching through the list. 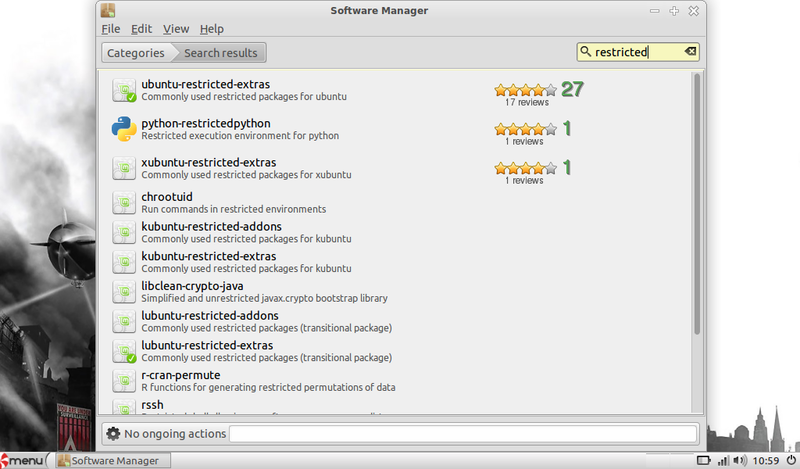 Each item has a rating which has been provided by Linux Mint users. This provides a useful guide when deciding whether to go with one application or another. To find a specific application use the search box in the top right corner. If you want to install the “Restricted Extras” package in order to play MP3s search for “restricted”. Normally when I am installing the “Restricted Extras” package I choose the one relevant to the system I am installing against. For instance if I am using Ubuntu I select the “Ubuntu Restricted Extras” and for Lubuntu I select the “Lubuntu Restricted Extras” package. It isn’t perfectly obvious which package you should choose for Peppermint, I went for the Lubuntu one and it resolved the MP3 playback issue mentioned earlier. You should hopefully be able to see that Peppermint OS is much like any other Linux distribution with a graphical desktop, a series of applications and the ability to install further applications from a graphical package manager. The one thing that sets Peppermint OS apart is the ICE editor which makes it possible to turn web applications into desktop applications. The ICE application is available from the Internet category on the Peppermint menu. When the application loads you can enter a name for the program, paste in the URL of the web application and select the menu you wish the application to appear under. You can also select an icon or use the favicon of the site that hosts the web application. The application will appear under the menu category you selected and when you click on the icon the application will load in a window much like any other desktop application. As you can see from the image above, I used the ICE application to create a desktop application version of Grooveshark and.it works perfectly. I read an article during the week which states that over 2000 classic MSDOS games have been added to the Internet Archive. I checked out the site and it is possible to play all of the games within a browser window using a customised version of the MESS emulator. Some of the comments that I read said that the archive have gone for quantity over quality and that it is hard to search for games. I checked out the archive and there is a certain amount of browsing involved to find games but I actually think that is a good thing, a bit like a lucky dip. When you find a game that you like you can simply bookmark the page. 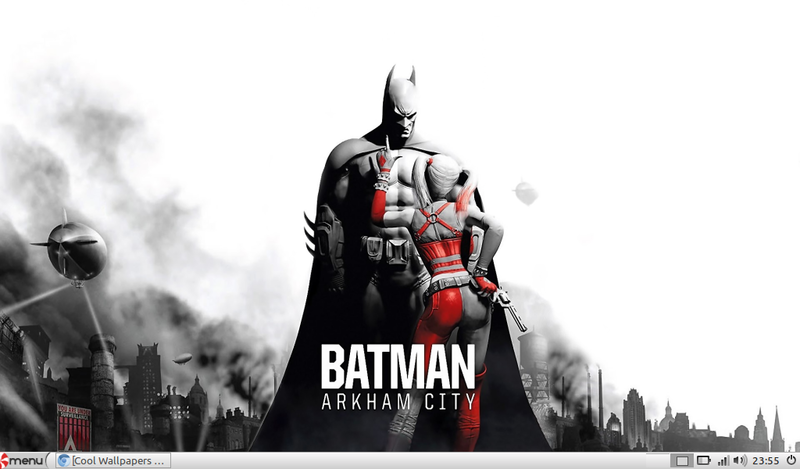 With Peppermint OS I thought that you could turn each of the games into a desktop application using the ICE application and you would then be able to select them from your games category. Unfortunately the ICE editor loses some of the path when you paste in the URL as the next screenshot demonstrates. One of the reasons I believe Peppermint uses the LXDE desktop is the fact that it is easy to create menu items. Every item you create using the ICE editor has an associated .desktop file within the folder /home/<user>/.local/share/applications. The Name entry is the name of the application and the Exec entry is the application which will run. The issue occurs because the Exec string has been truncated. 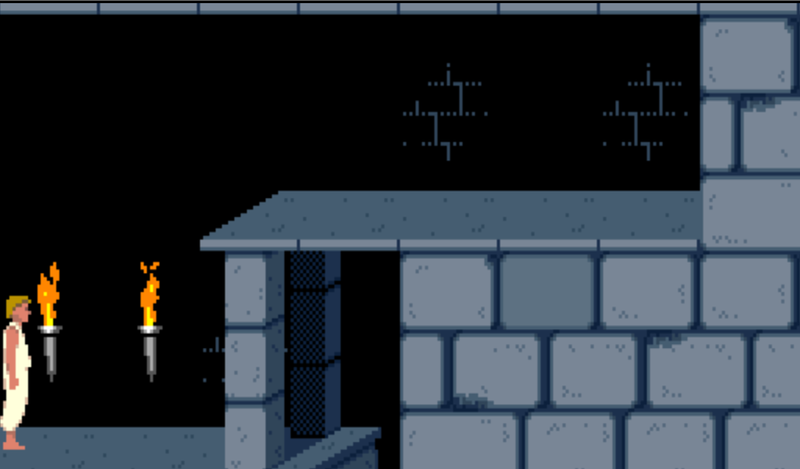 The bit after application= should be https://archive.org/stream/msdos_Prince_of_Persia_1990/Prince_of_Persia_1990.zip?module=dosbox&scale=2. Notice that everything after the ? has been truncated. Now obviously to get the game working I changed the text in the file and saved it and then the game worked properly as shown below. If the ICE application worked perfectly and you followed this guide to set up your joypad using QJoypad as shown in this guide then you would have a decent retro gaming machine. The ICE editor is a great tool but it is a shame that it doesn’t quite work for all applications. The LXDE desktop has loads of customisation features as shown in this guide. 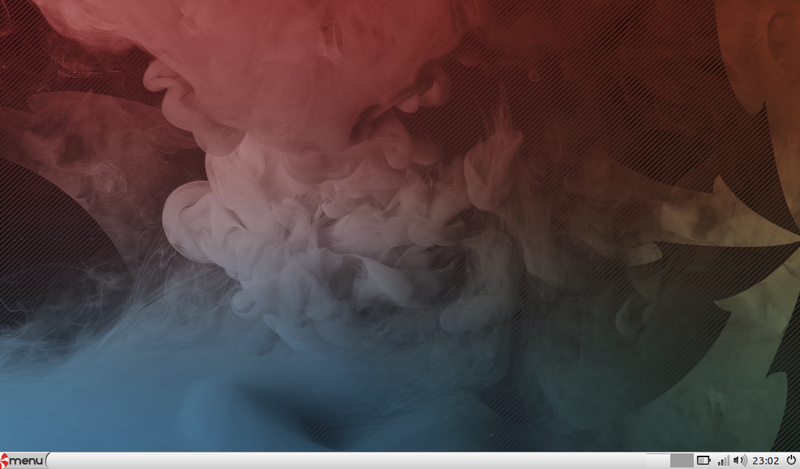 Within Peppermint, the desktop wallpaper is kind of dull and the whole appearance can be spruced up by right clicking and selecting desktop settings. You can change the wallpaper by choosing one that is installed on your computer. If you don’t have any good images to use search on Google Images. I decided to create a desktop application using ICE to search Google Images for desktop wallpapers. This would be a nice little desktop tool for changing wallpapers but unfortunately it failed for the same reason as the Internet Archive games. The “Desktop Preferences” application which is used to change the wallpaper has other settings such as changing desktop icons. One of the items in “Desktop Preferences” is a checkbox which when clicked should “show menus provided by window manager when desktop is clicked”. I checked this box and this had the effect of turning off the right click menu and nothing else happened. I think the problem may be the use of the XFWM window manager mixed in with LXDE settings. Most of the issues that I found are listed within the release notes. 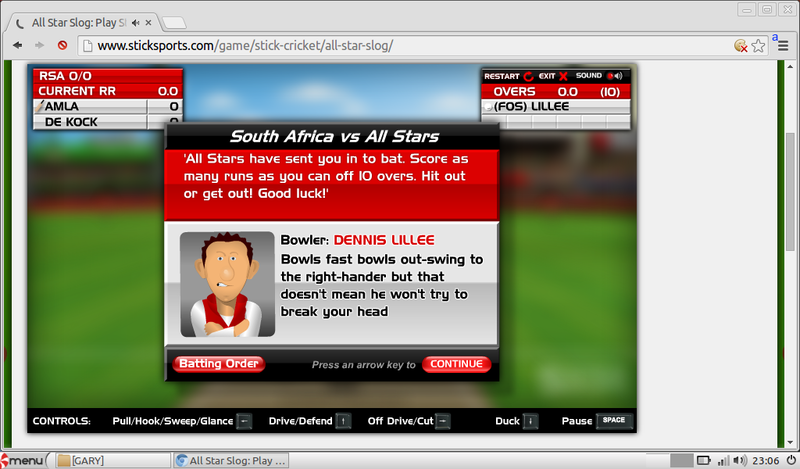 The Chromium browser has issues when you minimise and maximise as shown below. I really like Peppermint OS but there appears to be some regression and more issues since the previous release. I am not sure of the reasons for mixing and matching LXDE and XFCE components but I think it would be a good idea to just standardise so that you only use LXDE or XFCE and not a combination of both. If the ICE bug can be fixed then the use of Peppermint with the Internet Archive would enable you to use a machine with low specifications as a retro games console. (Ultimately what I was trying to do initially). Peppermint is a good distribution with some good concepts but I think it has become a little bit confused with its identity. Hopefully Peppermint 6 will resolve some of the issues mentioned. Nice review, the reasons for using Xfwm4 over Openbox as the window manager is for smoother and more refined graphics without compromising on lightness. For example, Xfwm4 allows softer rounded corner. This is something Openbox doesn't allow. It is also used to depart from reliance on what direction the LXDE development team are taking. The problem with Guayadeque is not a Peppermint specific problem. The developers are aware of the issue and recommend users install VLC as the "do all" replacement. It won't surprise me if VLC replaces it as the default audio/video player in Peppermint Six. 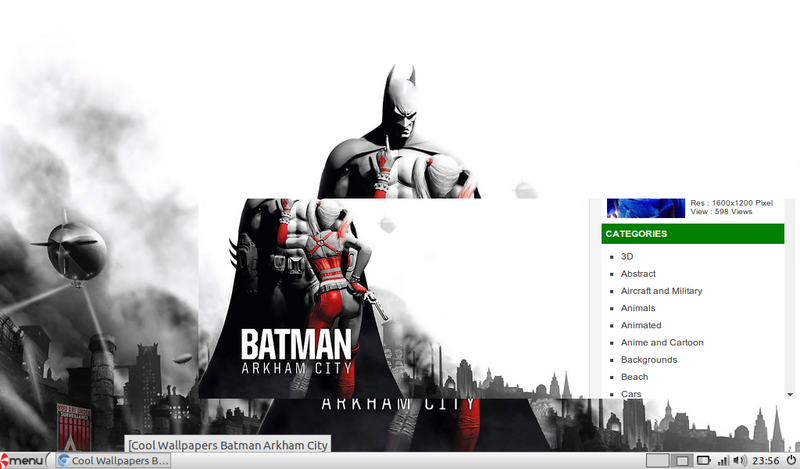 The graphical issue with Chromium/Chrome appears to be an issue with the Aura Graphic Engine. It seems to only affect older machines. Google appear to be reluctant to resolve the issue. Thanks for the comment Andy. How difficult do you think it would be for the developers to switch over fully to XFCE instead of LXDE? I guess it wouldn't be very difficult at all. The window manager is already in place. As far as I know there are no plans to switch over though. They are going to continue to develop their own version of the LXDE desktop. It is as I mentioned previously, they don't want to rely on the direction that LXDE or Xfce for that matter are taking for their desktop environment. I guess what is being developed is a de facto Peppermint Desktop. It is going to be interesting to see how the Peppermint Six desktop evolves from Peppermint Five. Just like Peppermint Four evolved from Peppermint Three by departing from Openbox to Xfwm4. I agree the way ICE truncates long URLs in irritating, especially if you are a nOOb. However, the average user probably will never encounter this. Still it would be nice have it resolved in Peppermint Six. Then make it available to Peppermint Five users via a PPA. I'm sure Kendall will resolve this when he is made aware of it. I wish Mozilla would resurrect their Prism project as that would resolve the reliance on Chromium/Chrome and their dodgy Aura Graphics Engine for the SSBs. It never hurts to dream.